Modern-day machine-made rugs have been unable to duplicate the quality of rugs made in the age-old tradition of hand weaving. Because machine-made rugs are usually constructed using either synthetic materials or inferior wool, they are prone to premature wearing and poor stain resistance. Also, machine hooking, tufting and gluing methods do not provide the structural integrity that the hand-knotting process does. Because of this, machine-made rugs often have more problems and require more maintenance than hand-made rugs. What most people don't realize is that for the same cost of a high-end, machine-made rug, one can buy a far superior hand-woven rug. Furthermore, machine-made rugs have very little resale value, while a good quality hand-knotted rug should maintain its value. What can never be duplicated in a machine-made rug is the human element, which is the essence of their beauty and uniqueness. Buying an Oriental rug can seem like a complex and bewildering task at first. You will be exposed to hundreds of rugs with a wide array of designs, colors, countries of origin and prices. However, a few simple steps in preparation can limit your choices to manageable proportions. Begin by measuring each area in which a rug is to be placed. As you measure, pay attention to floor vents, air intakes and fireplace hearths. Generally, you will want to allow for a border of hardwood or wall-to-wall around the carpet. When the ideal rug size is determined, it is helpful to allow for a certain amount of leeway. Consider the maximum and minimum sizes the area will accept. The greater the latitude in size, the more rugs you will be able to choose from. It can be helpful if you bring a sofa cushion or swatch of material with you to the showroom as you shop. We have found that even picking up one color that you are decorating with is sufficient, as an Oriental rug is an art piece that stands on its own. However, when one is ready to pick out an Oriental rug, the most important factor is that the color and design are pleasing to you. Oriental rugs are not merely floor coverings but hand-crafted art pieces portraying the weaver's artistic interpretation of color and design. It is quite possible that you may find several pieces that you feel would suit your needs. 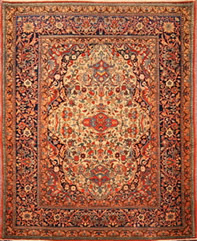 Any reputable Oriental rug dealer will allow you to try the rugs out for a few days without any obligation to keep them. The knowledgeable staff of The Magic Carpet look forward to helping you find that special piece that will bring warmth into your life and into your home. Buy from an established retailer of Oriental rugs who has a trusted reputation earned through serving the community. Avoid traveling auctions. They may be here today and gone tomorrow. 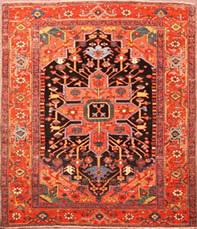 Often the rugs featured are those supplied by dealers who are unable to sell them due to poor quality or problems. You should protect yourself by being able to deal with someone on an ongoing basis. Beware of "Going Out of Business" sales which may be promotional schemes, where values are exaggerated and the quality of the merchandise is mediocre or below average. Also, if they do go out of business, there is no one to turn to. Be aware that sales with deep discounts like "50%," "60%" or even "90%" feature high mark-ups to accommodate this kind of discounting. The end result is that you may pay more for less.